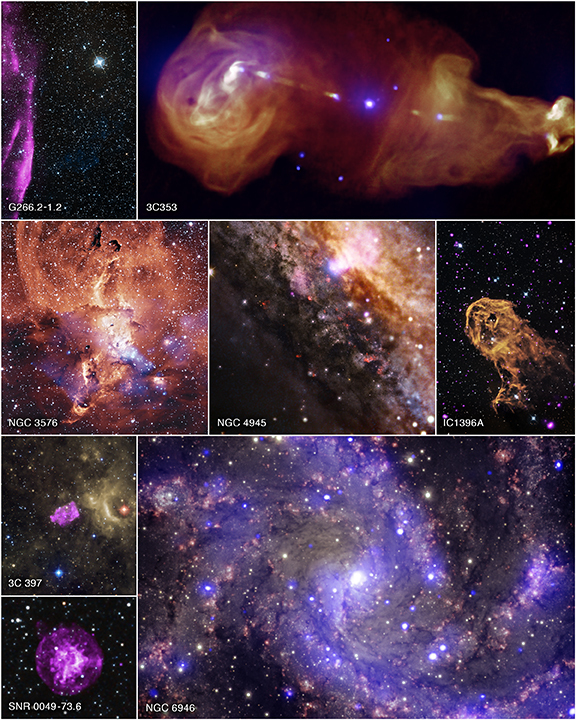 Chandra's archive enables access to its observations for scientists and the public. This collection of eight images is just a sample of vast stores in the archive. The primary role of Chandra's archive is to store and distribute data from the mission. Every year, October is designated as American Archive Month. While many people may think "archive" means only dusty books and letters, there are, in fact, many other types of important archives. This includes the use of archives for major telescopes and observatories like NASA's Chandra X-ray Observatory. The Chandra Data Archive (CDA) plays a central role in the mission by enabling the astronomical community - as well as the general public - access to data collected by the observatory. The primary role of the CDA is to store and distribute data, which the CDA does with the help of powerful search engines. The CDA is one of the legacies of the Chandra mission that will serve both the scientific community and the public for decades to come. To celebrate and support American Archive Month, we have selected images from a group of eight objects in the CDA to be released to the public for the first time. These images represent the observations of thousands of objects that are permanently available to the world thanks to Chandra's archive. G266.2-1.2 was produced by the explosion of a massive star in the Milky Way galaxy. A Chandra observation of this supernova remnant reveals the presence of extremely high-energy particles produced as the shock wave from this explosion expands into interstellar space. In this image, the X-rays from Chandra (purple) have been combined with optical data from the Digitized Sky Survey (red, green, and blue). Jets generated by supermassive black holes at the centers of galaxies can transport huge amounts of energy across great distances. 3C353 is a wide, double-lobed source where the galaxy is the tiny point in the center and giant plumes of radiation can be seen in X-rays from Chandra (purple) and radio data from the Very Large Array (orange). A region of glowing gas in the Sagittarius arm of the Milky Way galaxy, NGC 3576 is located about 9,000 light years from Earth. Such nebulas present a tableau of the drama of the evolution of massive stars, from the formation in vast dark clouds, their relatively brief (a few million years) lives, and the eventual destruction in supernova explosions. The diffuse X-ray data detected by Chandra (blue) are likely due to the winds from young, massive stars that are blowing throughout the nebula. Optical data from ESO are shown in orange and yellow. This image provides a view into the central region of a galaxy that is similar in overall appearance to our own Milky Way, but contains a much more active supermassive black hole within the white area near the top. This galaxy, known as NGC 4945, is only about 13 million light years from Earth and is seen edge-on. X-rays from Chandra (blue), which have been overlaid on an optical image from the European Space Observatory, reveal the presence of the supermassive black hole at the center of this galaxy. When radiation and winds from massive young stars impact clouds of cool gas, they can trigger new generations of stars to form. This is what may be happening in this object known as the Elephant Trunk Nebula (or its official name of IC 1396A). X-rays from Chandra (purple) have been combined with optical (red, green, and blue) and infrared (orange and cyan) to give a more complete picture of this source. 3C 397 (also known as G41.1-0.3) is a Galactic supernova remnant with an unusual shape. Researchers think its box-like appearance is produced as the heated remains of the exploded star -- detected by Chandra in X-rays (purple) -- runs into cooler gas surrounding it. This composite of the area around 3C 397 also contains infrared emission from Spitzer (yellow) and optical data from the Digitized Sky Survey (red, green, and blue). The details of how massive stars explode remains one of the biggest questions in astrophysics. Located in the neighboring galaxy of the Small Magellanic Cloud, this supernova, SNR B0049-73.6, provides astronomers with another excellent example of such an explosion to study. Chandra observations of the dynamics and composition of the debris from the explosion support the view that the explosion was produced by the collapse of the central core of a star. 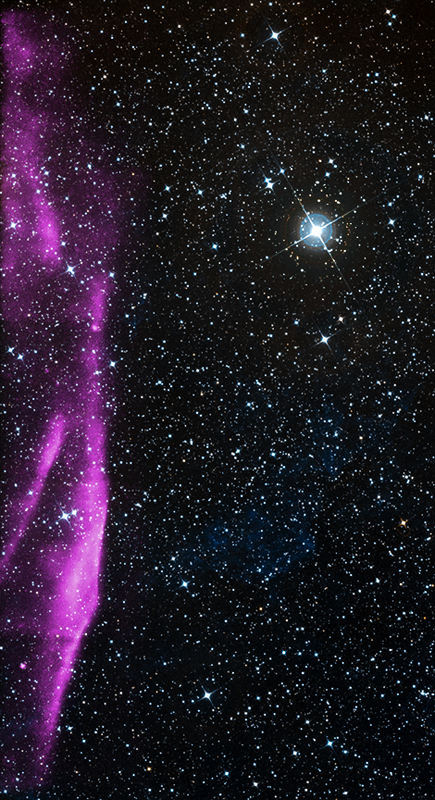 In this image, X-rays from Chandra (purple) are combined with infrared data from the 2MASS survey (red, green, and blue). NGC 6946 is a medium-sized, face-on spiral galaxy about 22 million light years away from Earth. In the past century, eight supernovas have been observed to explode in the arms of this galaxy. Chandra observations (purple) have, in fact, revealed three of the oldest supernovas ever detected in X-rays, giving more credence to its nickname of the "Fireworks Galaxy." This composite image also includes optical data from the Gemini Observatory in red, yellow, and cyan. Very cool this subject worthy of reading more. These images are creating a whole new way of understanding our universe. More grease to your elbow. Thank you for all the info and pics being posted here.I hope people, young generation specially, could appreciate this and get inspired to investigate, study, learn and communicate the science. Very interesting. Can I see more? What a wonderful resource the Chandra continues to be. You all should be very proud. These images are amazing. This is one of the best sites on the WEB. Not only the images but the information which is provided has given me a new and better understanding of our universe.